For as long as I could remember I’ve hated tomatoes. Raw tomatoes to be exact. We harvest hundreds of pounds of tomatoes every year and I can’t stand them. I like salsa fresca but it has to be blended almost smooth for me to eat it. If it’s got chunks of tomatoes I avoid them. 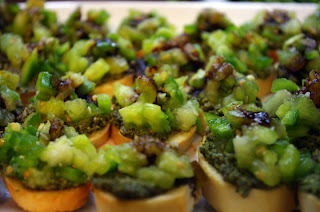 So one would assume that I never was a fan of bruschetta. You’d be right – I never ate it because of the chunky tomatoes. But I’m trying to change that. They still aren’t my favorite things but I’m being more adventurous. 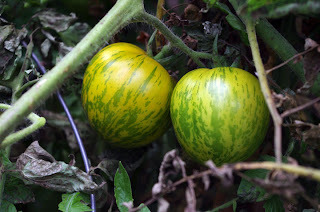 Some tomatoes still have this funky metallic taste to me but I’ve found that some varieties are OK and with the right accompanying ingredients they can be downright tasty. Two Fridays ago we went over to Esperanza’s house for dinner. She served tomato, basil and mozzarella on crostinis and I really like them. Heidi and Ute also joined us and she made bruschetta with pesto and balsamic dressing. She made a similar appetizer with roasted peppers. These dishes were the inspiration for this one. This past week we were visiting my mom in Ohio. It was both Tom and I’s first time visiting her there and we really enjoyed ourselves. The first full day we were there my mom hosted a big BBQ with her friends and neighbors. I wanted to make something for it and with her fabulous vegetable garden (hot weather plants just explode there!) I wanted to make something that featured some of her fresh garden produce. 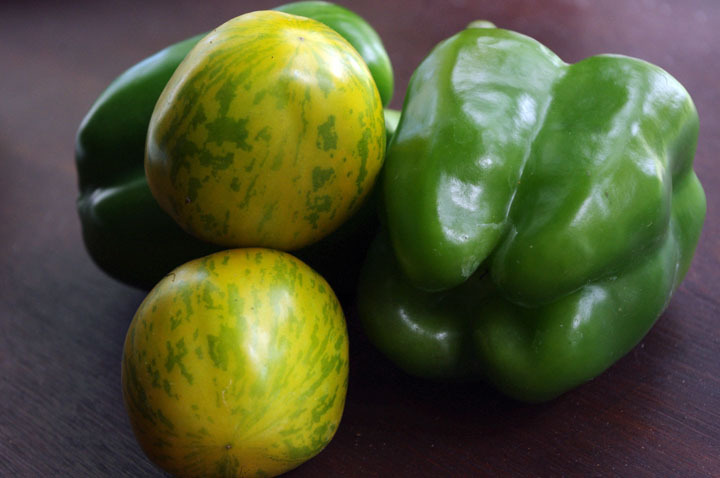 Her tomatoes were perfectly ripe and she had some enormous bell peppers and the biggest plants of basil I’d ever seen. I saw her Green Zebra tomatoes and knew I was going to start there. At first I started picking red peppers and then thought that if I was going to do a pesto it would be neat to stick with all green bruschetta. They were a hit and didn’t last long. There was even a group of women standing around them guarding them from any stray husband that might want to try them. Most of this recipe is not measured out because it really depends on how much you want. The proportions are all by taste. In a sauce pan add 1 cup of balsamic vinegar and half a cup of red wine. Bring up to a boil and then reduce to a simmer until mixture has thickened. Stir occasionally to keep from scorching. Finely chop 3 bell peppers and a couple of pounds of tomatoes and mix together. In a food processor add 2 or 3 handfuls of basil leaves, 1/4 cup Parmesan cheese, 2 garlic cloves and 1/2 cup walnuts or pine nuts. Start processing and add olive oil until the mixture becomes a thick paste. Add salt to taste. Mound tomato, pepper mixture onto baguettes. Drizzle some of the vinegar and wine reduction and then sprinkle each one with course salt. I know exactly how you feel about disliking tomatoes. I have never liked tomatoes as long as I can remember. Whenever they come on something I eat, I usually discard it to the side. It wasn't until this season when we grew 19 tomato plants, and I just didn't have the heart to tell my boyfriend that I don't like the little red fruit. But the tomatoes that I have been enjoying and eating stright from the plant, well, all I can say is this, every tomato that I have eaten up until this point in my life hasn't been a true tomato, just the shell of, the ghost of a former tomato. What I have learned is that tomatoes really are only good (at least to us non-tomato fanatics) when they have just been picked and are as fresh as they could be. That recipe you posted looks amazing, and I have so much basil, green peppers and tomatoes left in my garden, I do believe I will be rocking out this tasty bruschetta this week. Thanks for the idea!